Chances are that you haven’t see the moon this close before. Google Moon grant you that chance and take you back into time to view some cool maps and some photos taken on the moon from the crew of the Apollo series plus some exclusive photos from NASA. 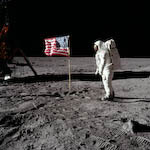 – These photos reminds me of the controversial debate of whether America really send Neil Armstrong, Michael Collins and Edwin Aldrin to land on the moon with Apollo 11. – The Apollo series that made it to the moon were Apollo 11, 12, 14, 15, 16, and 17. Apollo 13 didn’t make it. If you haven’t watch Apollo 13 (starring Tom Hanks) maybe you should. – Looks like Google Maps ain’t for the earth only. However, when it comes to astrology, Microsoft has probably done better then Google with their Microsoft Worldwide Telescope.